In this week's Wednesday Werk, we'll look at the Crannit. The Crannit is an extraplanar creature that typically spans across multiple planes and searches for occult wisdom. Due to their multiplanar perspective, Crannits can see the invisible and (so the stories say) even the future. These creatures scour the planes for lore, and will willingly deal with anyone who has something to trade or offer. Conversely, however, the creatures will viciously attack anyone who attempts to deny them knowledge. If a Crannit learns of a spell or magic item that another creature is attempting to keep to itself, that creature can expect the Crannits to soon come calling. As with many creatures that span across planes, it is unclear whether a Crannit dies when slain, or whether it merely dispels that version of the creature. Scholars certainly do not know enough about them to have a definitive answer. 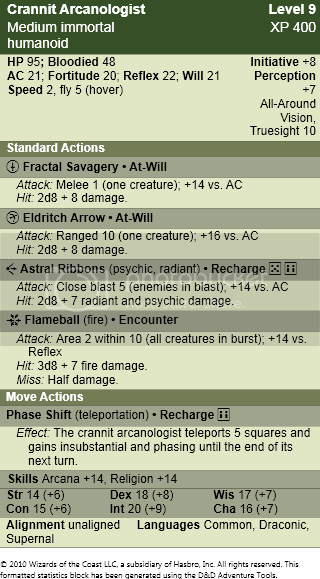 In combat, the creatures will typically try to target multiple foes with Flameball or Astral Ribbons before picking them apart with Eldritch Arrow. If engaged in melee, the creatures will use Phase Shift to reposition and avoid opportunity attacks. If provoked to attack a target to gain arcane lore, Crannits will frequently fight to the death. If attacked, the creatures will frequently attempt to flee.